Affordable Housing is an option for low income, disabled persons in the community to rent safe quality housing. All units are priced to be well below market rate rents and are maintained to the highest standards. Applicants must be income qualified. Most units are accessible to persons with mobility limitations. Utilities are not included in rent. The Cardinal Mindszenty Apartment Building comprises 37 units providing safe, quality one to three bedroom apartments. 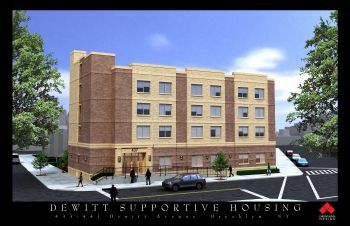 Apartments are available to the general public who have low income, preference is given to persons with disabilities. The Dunkirk Renovation & Ownership Program (DRO) is a 49 unit, mixed-income, multi/large family, scattered site, supportive housing,home ownership education project. This project will include the rehabilitation and new construction of homes along and in close proximity to U.S. Route 60, one of the major arterials into the City of Dunkirk's core. The project involves the development of 25 buildings on scattered sites. The buildings will be one and two-story, wood frame construction. The unit mix includes one, two, three and four-bedroom apartments. Average unit size is 745 sq. ft. for the one-bedrooms, 850 sq. ft. for the two-bedrooms, 1150 sq. ft. for the three-bedrooms, and 1300 sq. ft. for the four bedrooms units. Every unit in the project will be equipped with an Energy Star stove, refrigerator, washer and dryer, and central air conditioning. All units are non-smoking and do have a pet policy in place. Click here for a Dunkirk Renovation & Ownership Program (DRO) referral application. Pine Valley Apartment Building comprises 21 units providing safe, quality one to three bedroom apartments. All apartments are open to general public who have low income. The First Street Apartment building comprises 16 units providing safe, quality one and two bedroom apartments. Apartments are open to the general public who have low income, preference is given to persons with disabilities. For more information or to request a housing application, please call the Affordable Housing Manager at 716.366.7400 x 200. Click here for a referral application.